The introduction of corticosteroids and later, cyclophosphamide dramatically improved survival in patients with proliferative lupus nephritis, and combined administration of these agents became the standard-of-care treatment for this disease. However, treatment failures were still common and the rate of progression to ESRD remained unacceptably high. Additionally, treatment was associated with significant morbidity. Therefore, as patient survival improved, the goals for advancing lupus nephritis treatment shifted to identifying therapies that could improve long-term renal outcomes and minimize treatment-related toxicity. Unfortunately, progress has been slow and the current approaches to the management of lupus nephritis continue to rely on high-dose corticosteroids plus a broad-spectrum immunosuppressive agent. Over the past decade, an improved understanding of lupus nephritis pathogenesis fueled several clinical trials of novel drugs, but none have been found to be superior to the combination of a cytotoxic agent and corticosteroids. Despite these trial failures, efforts to translate mechanistic advances into new treatment approaches continue. 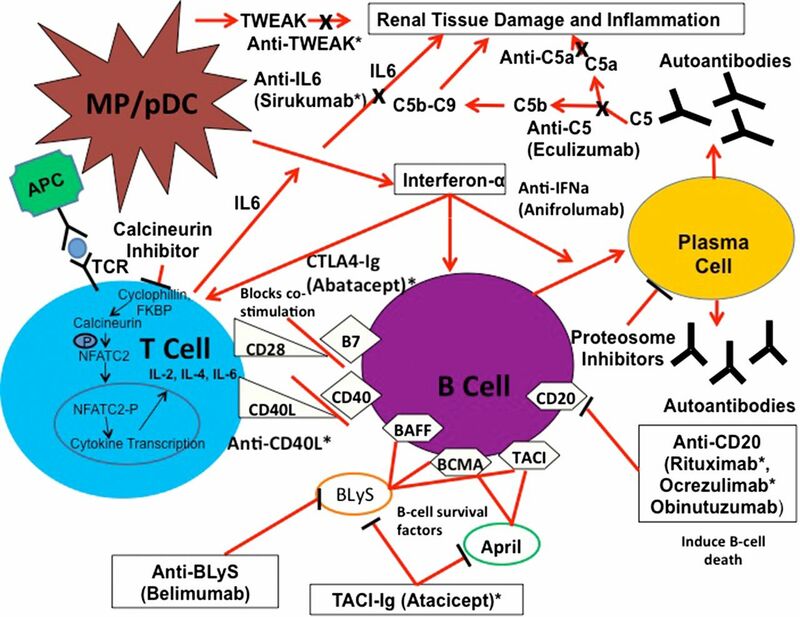 In this review, we discuss current therapeutic strategies for lupus nephritis, briefly review recent advances in understanding the pathogenesis of this disease, and describe emerging approaches developed on the basis of these advances that promise to improve upon the standard-of-care lupus nephritis treatments. Despite these sobering facts, advances in our understanding of the pathogenesis of LN13 are fueling efforts to translate this knowledge into new management approaches. These efforts will be described here. The initial treatment of active proliferative LN is termed induction and the mainstream approaches to induction are shown in Figure 1. The principle goal of induction is to rapidly attenuate immune complex–mediated renal inflammation to permit the injured renal parenchyma to heal. However, the landmark National Institutes of Health (NIH) study that led to the routine use of cyclophosphamide plus prednisone for induction revealed another, equally important goal of induction therapy in LN. Patients treated with cyclophosphamide and corticosteroids had fewer renal relapses and a lower incidence of future kidney failure than patients treated with corticosteroids alone, but this benefit was not realized for 3–5 years.5 The addition of cyclophosphamide did not improve short-term renal outcomes compared with corticosteroids, but did preserve kidney function in the long-term. These findings raised the possibility that in addition to controlling inflammation and its deleterious effects, the right type of induction therapy could also alter the immune system sufficiently to preserve kidney function long-term. New therapies for LN induction should therefore be measured against the combination of cyclophosphamide and corticosteroids in terms of both immediate and long-term renal outcomes. Unfortunately, in clinical trials of induction therapies the long-term assessment of kidney function is often neglected. Current standard of care treatment protocols for LN induction therapy. Patients with proliferative forms of LN are treated with oral corticosteroids, typically prednisone starting at 1 mg/kg per day and tapered over weeks to months. In severe disease with rapid deterioration of kidney function, high-dose intravenous methylprednisolone (0.25–1 g/d) is often given for 1–3 days preceding oral corticosteroids. In addition to corticosteroids one of four immunosuppressive regimens using cyclophosphamide or MMF is generally used. The NIH high-dose regimen consists of monthly intravenous pulses of cyclophosphamide dosed at 0.5–1 g/m2 for 6 months. Oral cyclophosphamide dosed at 1–1.5 mg/kg per day for 2–4 months provides a cumulative cyclophosphamide burden similar to the NIH regimen. In both cases cyclophosphamide is dosed based on nonobese body weight. The Euro-Lupus (low-dose) intravenous cyclophosphamide regimen is dosed at 500 mg every 2 weeks for six total doses. Cumulative cyclophosphamide for the Euro-Lupus regimen is 3 g, which is at least 50% lower than the NIH regimen. MMF is given for 6 months and dosed at 2–3 g/d. The duration of induction therapy is generally 3–6 months (Figure 1). Attaining a complete clinical or histologic renal remission by the end of induction occurs in only a modest number of patients.7–10,23 Furthermore, LN often relapses and ongoing treatment is needed to limit disease flares over time. Therefore, the principal goal of maintenance therapy is to consolidate the response that was achieved by induction therapy into a complete clinical remission and to keep patients relapse-free while minimizing treatment toxicity. Intravenous cyclophosphamide given quarterly was the first maintenance regimen evaluated for LN, but was associated with significant toxicity.24 Subsequent studies found that maintenance with azathioprine or MMF was more effective and less toxic than cyclophosphamide in preventing ESRD or death after 1–3 years of follow-up.24 Since then two large prospective, randomized controlled trials (RCTs) directly compared MMF to azathioprine for maintenance.14,20 The MAINTAIN nephritis trial randomized 105 white patients with LN to MMF or azathioprine and found no difference between these treatments in time to first renal flare.14 In contrast, 227 responders in the multiracial ALMS trial were rerandomized to MMF or azathioprine for maintenance, and MMF was found to be superior to azathioprine in preventing the composite end point of death, ESRD, doubling of serum creatinine, LN flare, or need for rescue therapy.20 Additionally, the patients maintained on azathioprine tended to do worse if induced with MMF. Although MMF is the therapy of choice for LN maintenance for most patients, azathioprine is effective and using these drugs can be individualized to specific patient circumstances. For example, azathioprine can be safely used in pregnancy whereas MMF is contraindicated. One of the most important questions concerning maintenance therapy is its duration. There are few convincing data to answer this question. The optimal length of maintenance therapy is unclear, with durations of 12–36 months studied in clinical trials.20,24,26 Indefinite treatment may be considered in individual cases based on disease severity and relapse risk.27 A current NIH-sponsored trial (identifier: NCT01946880) is evaluating disease flare in patients weaned off MMF maintenance therapy. A detailed discussion of LN pathogenesis is beyond the scope of this review. However, it is relevant to briefly summarize current thoughts on pathogenesis to understand the rationale behind emerging therapies. It is therefore reasonable to think of active LN as an inflammatory process occurring in parallel to a background, tonic level of systemic and intrarenal autoimmunity that can continually replenish the proinflammatory mediators needed to injure the kidney. The approach to LN management thus needs to be two-pronged: attenuation of inflammation to curtail further renal damage and suppression of autoimmunity to prevent exacerbations of disease activity (induction and maintenance therapy). Anti-inflammatory treatments should improve kidney function acutely (e.g., corticosteroids) but may not be sufficient to prevent long-term renal damage. Alternatively, therapies that target autoimmunity would not be expected to acutely resolve inflammation, but should prevent further disease flares and preserve the kidneys. It is likely that several recent therapeutic failures of novel LN drugs may have been due to trial end points focused on short-term improvements using drugs better suited for suppressing autoimmunity and achieving long-term benefits. Novel therapies target the principal components of the immune system that contribute to LN pathogenesis. This schema illustrates current thoughts on the cells, cytokines, and growth factors and their interactions that amplify kidney injury and facilitate ongoing autoimmunity in LN. During LN circulating plasmacytoid dendritic cells enter the kidney and release IFN-α, and IFN-α then stimulates antigen presenting cells, promotes B cell differentiation into plasma cells, and facilitates production of TH1 and TH2 cells. B cells also present autoantigens to T cells which leads to T cell activation and release of proinflammatory cytokines such as IL-6. B cell and T cell proliferation is dependent upon costimulation which occurs independently from antigen presentation through interactions between CD28:B7 and CD40L:CD40 located on T and B cells respectively. Additionally, the B cell stimulators Blys and APRIL function to activate B cells and prolong survival. Autoreactive plasma cells produce autoantibodies that bind autoantigens and form immune complexes. These immune complexes deposit in the renal parenchyma, activate the alternative complement pathway, and recruit proinflammatory cells to the kidney leading to tissue damage and inflammation. The putative points of interaction of novel therapeutics and pathogenic mechanisms are indicated. Therapies with an asterisk have already been studied in clinical trials. Other therapies that are currently being studied or that we would like to see studied are also shown. As suggested above and illustrated in Figure 2, all of these components of the immune system interact with each other to amplify inflammation and facilitate autoimmunity. Therapeutics designed to target these pathways have been developed and their interactions with LN pathways are shown in Figure 2 and discussed in detail below. Table 1 presents an overview of the therapeutic landscape of LN. Included in the table are several recently completed trials which failed to meet their end points but provided important insights to inform future trials. Additionally, all current trials of novel LN therapeutics are listed. B cells have a central role in LN pathogenesis (Figure 2) and are therefore attractive therapeutic targets. Several uncontrolled studies reported a benefit of the B cell depleting agent rituximab, an anti-CD20 monoclonal antibody, however early enthusiasm was tempered by the failure of the Lupus Nephritis Assessment with Rituximab Study (LUNAR), a large RCT that compared SOC plus rituximab to SOC plus placebo.10 Despite these mixed results there is continued interest in studying rituximab and other B cell depleting agents for treatment of LN. Additionally, trial design issues have been raised for LUNAR. One important consideration is that in LUNAR rituximab was evaluated for short-term (52 weeks) effects as an induction drug even though it does not directly attenuate inflammation. Although rituximab does attenuate disease early in some autoimmune processes, it may not be anticipated to do so in LN, as it does not directly or rapidly affect inflammation. Instead, B cell depletion may have more effect if examined over a longer time, and at the 76-week LUNAR follow-up some separation between the rituximab and placebo arms became apparent.10 There is evidence that B cell depletion does affect autoimmunity. Belimumab, a humanized anti-BAFF monoclonal antibody, was found to be effective in nonrenal SLE.66 Although patients with severe LN were excluded from the belimumab RCTs, a post hoc analysis of the cohorts demonstrated a decreased rate of renal flares in patients treated with belimumab compared with placebo.67 However, in two equally large studies of tabalumab, another anti-BAFF antibody, in nonrenal SLE, there was no difference in renal flare rate between placebo and tabalumab.68 A phase 3 RCT is currently underway to evaluate belimumab directly in LN, and importantly, it will continue for at least 2 years (identifier: NCT01639339). To address this concern, a trial of B cell depletion in LN is being repeated with obinutuzumab, a type 2 chimeric, anti-CD20 monoclonal antibody that causes more complete peripheral and lymphoid tissue B cell depletion than rituximab.71,72 It is possible that obinutuzumab will perform better than rituximab by more effectively depleting peripheral and renal interstitial B cells. Tissue depletion will be assessed by an optional repeat kidney biopsy at 52 weeks (identifier: NCT02550652). Finally, BAFF levels increase with B cell depletion73 and it is suspected that B cell repopulation in a BAFF-rich environment promotes the production of autoreactive B cells by bypassing tolerance checkpoints. Murine studies have shown that autoreactive B cells are preferentially repopulated after initial depletion.74–76 High circulating BAFF levels have been associated with SLE flare.48,77 Taken together, these data suggest that B cell repopulation in a low BAFF environment after rituximab is given might lead to a more tolerant B cell repertoire, less autoreactivity, and a sustained clinical response. The Immune Tolerance Network CALIBRATE study will test this hypothesis by sequential administration of cyclophosphamide plus rituximab followed by belimumab in a multicenter RCT (identifier: NCT02260934). Proteasome inhibitors target plasma cells. The boronic acid derivatives bortezomib, carfilzomib, delanzomib, and ixazomib are proteasome inhibitors used to treat multiple myeloma by inducing apoptosis in plasma cells. Murine models of SLE and LN have shown that proteasome inhibitors are effective in treating lupus and can ameliorate and prevent nephritis.82,83 These drugs attenuate IFN-α production by blocking toll-like receptor–mediated plasmacytoid dendritic cell activity, inhibit induction of several NF-κB–dependent proinflammatory cytokines, and appear to increase T regulatory cells (Tregs) in experimental lupus models.83,84 Thus proteasome inhibitors may have a dual effect in the induction phase of LN treatment, acting as anti-inflammatory and antiautoimmunity agents. Proteasome inhibitors have received little attention in human lupus. Bortezomib was given to 12 patients with refractory SLE, half with LN.85 After 3 months, double-stranded DNA levels, circulating plasma cells, and proteinuria fell. This study was terminated due to neurotoxicity, a known side effect of bortezomib.85 Newer generation proteasome inhibitors, including carfilzomib and ixazomib citrate, may be associated with less neurotoxicity.86 Ixazomib citrate, an oral proteasome inhibitor, is currently being evaluated for treatment of proliferative LN in a phase 1 study of patients who have had incomplete responses to SOC therapy (identifier: NCT02176486). Corticosteroid use seems almost mandatory for LN treatment, but this notion is being challenged by the Rituximab and Mycophenolate Mofetil without Oral Steroids for Lupus Nephritis (RITUXILUP) trial that combines B cell depletion with MMF and limited intravenous methylprednisolone pulses while eliminating oral corticosteroids entirely. The RITUXILUP protocol was evaluated in a single-center study of 50 patients with class 3, 4, or 5 LN.87 All patients received two 1 g doses of Rituximab plus 500 mg of methylprednisolone on days 1 and 15 followed by maintenance with MMF. At 52 weeks half the patients achieved a complete clinical response and 34% had a partial response. These response rates are comparable to those reported for several recent large RCTs.7–10 Adverse events were infrequent and less than with current SOC. To validate these findings, a noninferiority prospective, multicenter RCT evaluating the efficacy of the RITUXILUP regimen is underway (identifier: NCT01773616). Of note, high-dose methylprednisolone is an effective anti-inflammatory treatment. In an RCT comparing SOC to B cell depletion with ocrelizumab, a humanized anti-CD20 antibody, >70% of patients who received 1000 mg of methylprednisolone at the beginning of induction achieved a complete response regardless of intervention group.88 These data suggest that the 1000 mg of methylprednisolone given in the RITUXILUP trial may be sufficient to control inflammation while providing rituximab and MMF the time needed to suppress autoimmunity. The CD28/CD80 costimulatory pathway in LN has been targeted with abatacept in three RCTs. Two of these trials failed to demonstrate any benefit of adding abatacept to SOC LN induction treatment.8,15 Data from the third trial are pending. Although abatacept does not have any direct anti-inflammatory activity, these trials evaluated it as an induction therapy with short-term (6–12 months) response end points. Because abatacept blocks one of the pathways important in autoimmunity it may have performed better if it had been evaluated as an antiflare therapy. Evidence from the Abatacept and Cyclophosphamide Combination Therapy for Lupus Nephritis (ACCESS) trial, which compared abatacept plus low-dose cyclophosphamide to placebo plus low-dose cyclophosphamide, supports this idea. Patients in the abatacept arm who achieved a complete renal remission at 24 weeks were followed for an additional 6 months without maintenance therapy. At 12 months only one of 22 abatacept patients had a new flare, compared with three of 21 placebo patients who received azathioprine maintenance. Blocking costimulation may be most effective in LN as a treatment for maintenance of remission, but this will need to be formally tested. Because many components of the immune system are simultaneously engaged in the generation of systemic and renal autoimmunity (Figure 2), it may be too optimistic to assume that intervening in a single pathway or depleting a single cell type will be sufficient to treat LN. In an effort to interfere with several aspects of the immune system at once in LN, a multitarget approach has been tested in a large Asian cohort.91 The multitarget regimen of corticosteroids, tacrolimus, and MMF was compared with a SOC regimen of corticosteroids plus intravenous cyclophosphamide. The calcineurin inhibitor (CNI) tacrolimus was used to better target T cells. CNIs block T cell activation (Figure 2) and prevent the release of several proinflammatory cytokines.92 This trial demonstrated a significantly higher rate of complete renal remission in the multitarget group compared with SOC at 6 months. However, this result should be interpreted with caution because reduction in proteinuria is the major clinical determinant of renal remission in LN and CNIs can attenuate proteinuria through immune and nonimmune mechanisms.93 We suggest that the usual clinical means of assessing renal remission may not be applicable in LN patients treated with a CNI, and it may be necessary to consider post-treatment kidney biopsies to ensure resolution of immune renal injury. Repeat biopsies were done in a small number of patients in this trial and the kidneys of the multitarget and cyclophosphamide showed similar improvement. Other caveats in the interpretation of this trial are that follow-up was very short, and the results may not be applicable to non-Asian populations. Long-term data on kidney survival after a CNI-based induction regimen are needed. Some of these issues will be addressed in a current 24-week trial comparing a multitarget regimen using the new generation CNI voclosporin to SOC in a racially diverse population (identifier: NCT02141672). CNIs (plus corticosteroids) have also been used as the only immunosuppressive agents in the treatment of proliferative LN. The Cyclofa-Lune study compared cyclosporine to intravenous cyclophosphamide in white patients, and renal outcomes were similar between the groups at 18 months and 7.7 years (median follow-up).94 In another study, Chinese patients with LN were treated with tacrolimus or MMF for 6 months, and azathioprine maintenance in responders, and followed for 5 years.95 The primary outcome of a stable serum creatinine and a 24-hour urine protein-to-creatinine ratio of <1 at 6 months was achieved in 59% of the MMF group and 62% of the tacrolimus group. However, reversible increases of ≥30% in serum creatinine were only seen with tacrolimus, and compared with MMF over 5 years, the tacrolimus patients tended to have more renal flares. These data support the need for careful long-term studies in CNI-treated LN patients to ensure that favorable kidney outcomes are due to controlling immune injury and not masking proteinuria through nonimmune mechanisms. IFN-α appears to have a central regulatory role in SLE and LN, and therefore potential as a treatment target. Anifrolumab, a monoclonal antibody against IFN-α receptor 1, has recently been evaluated in nonrenal SLE and was shown to be significantly more effective than placebo, primarily in patients who had a high type 1 IFN gene signature.96 The TULIP-LN1 study will evaluate the safety and efficacy of anifrolumab plus SOC for the treatment of proliferative LN (identifier: NCT02547922). Of note, during screening for TULIP-LN1 the type 1 IFN signature will be measured in potential participants and patients will be stratified into high- or low-IFN groups. This is particularly important, as few LN clinical trials have measured the biologic target of a novel therapy prior to treatment. Treating patients not expressing a drug’s biologic target may have contributed to past trial failures. The goal of LN treatment is to preserve long-term kidney health, and current practice suggests this is best done by inducing an early renal remission and preventing further episodes of active disease. Commonly used SOC treatments are suboptimal and toxic. Several novel approaches to treatment that have more specific effects on the immune system have been studied with disappointing results. Lessons learned from these trials have, to some extent, informed the next wave of investigation into novel treatment solutions for LN, and will hopefully result in one or more new therapies than can be matched specifically to an individual’s disease. B.H.R. is a consultant for Genetech (San Francisco, CA), Pfizer (New York, NY), Glaxo-Smith Kline (Brentford, UK), Mallinckrodt (Saint Louis, MO), Biogen Idec (Cambridge, MA), AstraZeneca (London, UK), and Pharmalink AB (Stockholm, Sweden). S.V.P. received a Fellowship Grant from Mallinckrodt Pharmaceuticals and has participated on an advisory board for Alexion Pharmaceuticals (Cheshire, CT).